Samarra Archaeological City is the site of a powerful Islamic capital city which ruled over the provinces of the Abbasid empire extending from Tunisia to Central Asia for a century. It testifies to the architectural and artistic innovations that developed there and spread to the other regions of the Islamic world. Among its architectural monuments are the 9th century Great Mosque and its Spiral Minaret, and the Caliphal Palace. 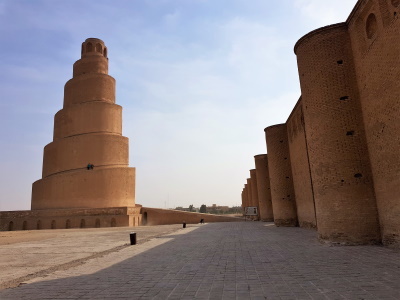 Damaged in War since WWII: 2nd Iraq War "One of the architectural jewels in Samarra is the 52-metre spiral minaret which is part of the Great Mosque of Caliph al-Mutawakkil, built in the ninth century. 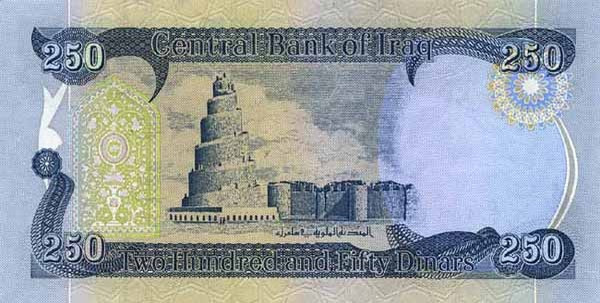 The minaret, which features on an Iraqi banknote, survived countless invasions and wars, but was badly damaged by insurgent fire in 2005 when American soldiers used it as a lookout post." Built in the 9th century: Samarra was laid out as a new city in 836 by the Abassid Caliph al-Mu'tasim who wished to create a new court residence and army base outside Baghdad. He died in 847 with the city's mosques and palaces only partly completed but his successor continued with new plans. By 892 a subsequent Caliph returned the capital to Baghdad an, although habitation continued on the site much of the monumental area was abandoned. Modelled after: The Terbal of Firuzabad (Sassanid landscape WHS) is thought to have been the architectural predecessor of the Great Mosque of Samarra of Iraq and its distinctive minaret, the malwiya. 6 Community Members have visited.